1.1 The Northeast Monsoon conditions prevailed over the ASEAN region in February 2017. Dry weather conditions persisted over most areas of the Mekong sub-region, except over parts of Thailand and Cambodia where brief periods of showers were observed. During the month, the monsoon rain band was between the Equator and 15 S, and rainy weather conditions were experienced over most parts of the southern ASEAN region. The rainfall distribution for February 2017 is shown in Figure 1. Figure 2: Percentage of Normal Rainfall for March 2017. The rainfall data may be less representative for areas with low density of rainfall network. 1.2 In February 2017, rainfall was below-normal in parts of Myanmar, northern and central Thailand, Lao PDR and Cambodia. 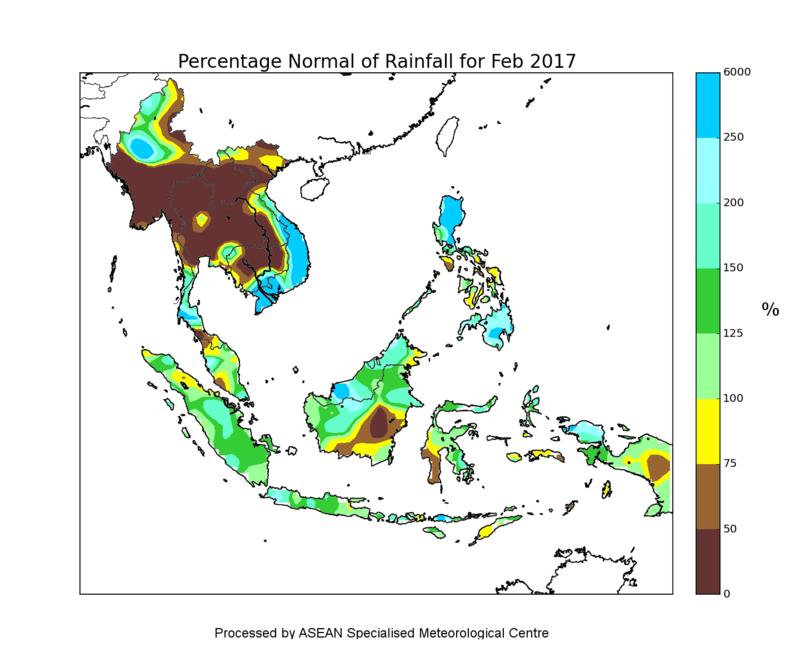 Rainfall was above-normal over most parts of Vietnam and the Philippines. In contrast, rainfall was mostly near-normal to above-normal in the southern ASEAN region. The percentage normal of rainfall for February 2017 is shown in Figure 2. 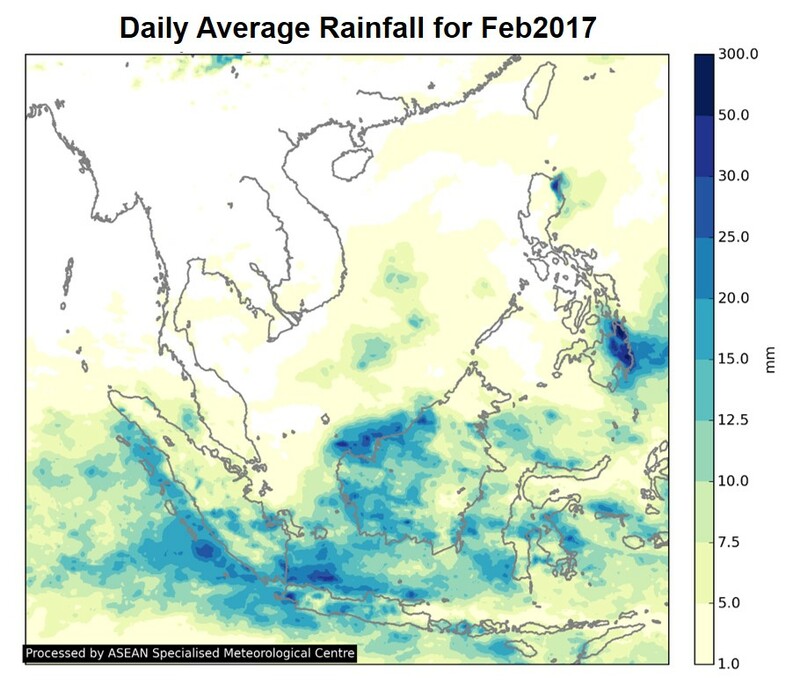 1.3 Most of the rainfall activities in February 2017 was concentrated between the the Equator and the region around Java, and Mindanao, the Philippines (Figure 1). In mid-February, a strong monsoon surge brought a strengthening of winds and enhanced rainfall activities over the southern ASEAN region. The heavy rainfall associated with the monsoon surge fell mainly over coastal areas of Sarawak and the Java Sea. During the second half of February, some parts of Java as well as Jakarta Indonesia, were affected by heavy rains and floods due to localised thunderstorm activities. 1.4 In February 2017, north-easterly winds prevailed over the northern ASEAN region while winds in the southern ASEAN region blew predominantly from the west or northwest. Figure 3 shows the average and anomalous winds at 5000 feet. During the month, winds from the northern and southern hemispheres converged between 5 S and 10 S, and westerly or south-westerly wind anomalies prevailed over the Java Sea and the eastern parts of the Maritime Continent. In addition, the occurrence of cyclonic circulation anomalies over the Western Pacific Ocean contributed to the above-normal rainfall over the Philippines. 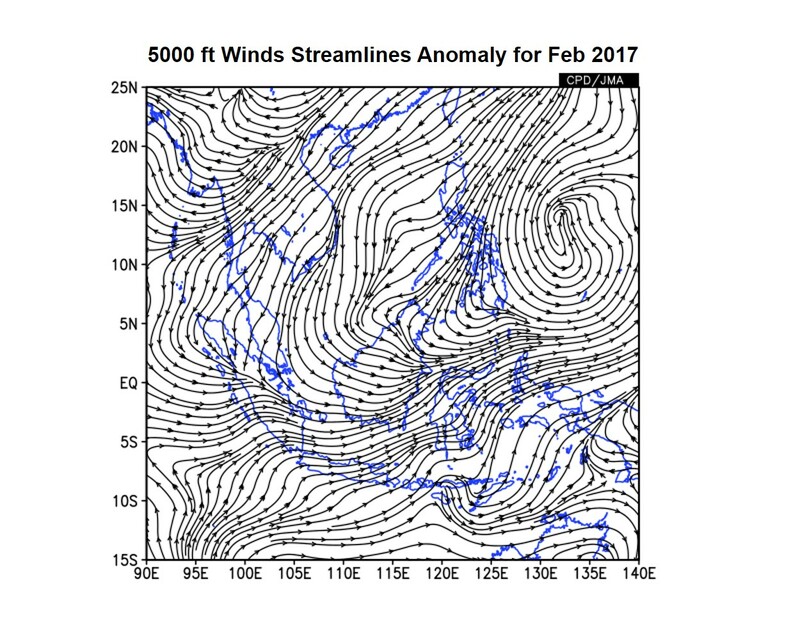 Figure 3: 5000 ft average winds streamlines (left) and anomaly (right) for February 2017. 1.5 The cool anomalies of the equatorial Pacific Ocean’s sea-surface temperature (SST) over the Niño 3.4 region weakened further but remained within the neutral (neither El Nino nor La Nina) thresholds. Most of the atmospheric conditions over the equatorial Pacific were in near average conditions, except for cloudiness and rainfall over the central and western tropical Pacific which remained indicative of weak La Niña conditions. 1.6 The Madden Julian Oscillation (MJO) was active and strong in February 2017 and is likely to have played a significant role on the rainfall over the tropical region during this period. In the first week of February 2017, the MJO was in Phase 4-5 and brought enhanced shower activities over the southern parts of Maritime Continent. 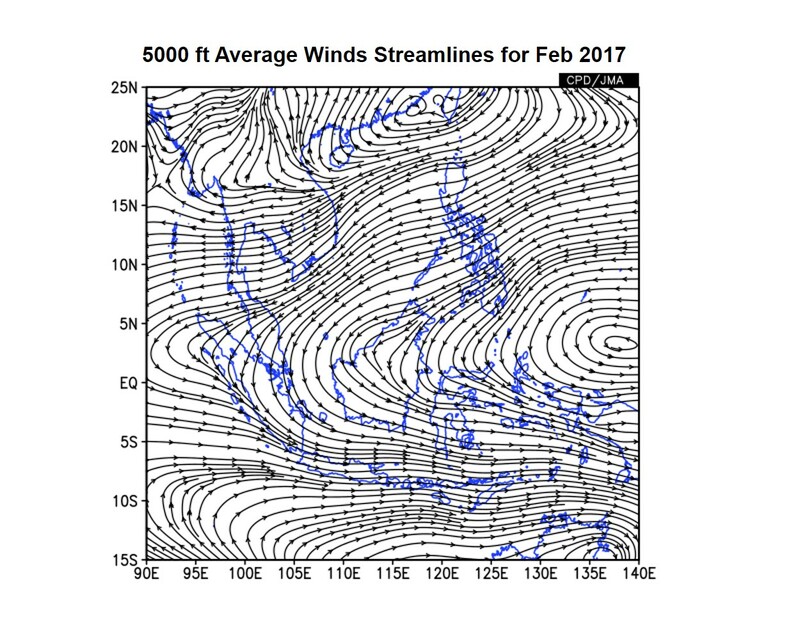 In the second and third week of February 2017, the MJO strengthened and propagated through Phase 6-8, which contributed to less convective activities over the western Maritime Continent including parts of Sumatra and Peninsular Malaysia. The MJO continued its passage into Phase 1-2 towards the end of February 2017. 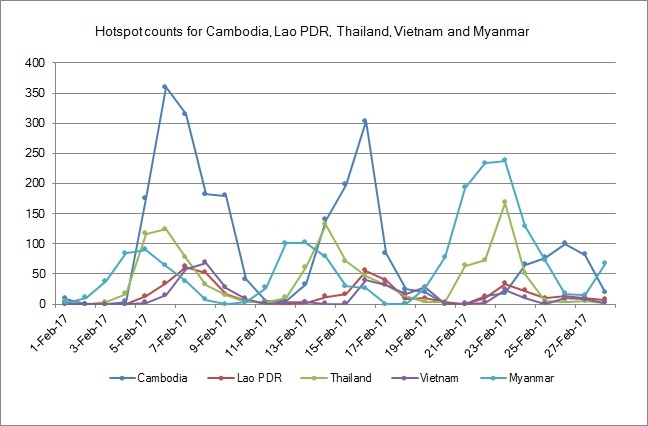 2.1 In the Mekong Sub-region, hotspot activities persisted mainly in Thailand and Cambodia during the first half of February 2017. Visible smoke plumes and moderate haze were observed in parts of northern Cambodia on a few days. In the latter half of the month, brief periods of shower activities helped to prevent further escalations in hotspot activity over Cambodia. However, in Myanmar, there was a deterioration in the fire situation with the prevailing dry weather conditions, and led to an increase in the number of detected hotspots. 2.2 The hotspots in Myanmar were detected mainly along the Arakan ranges and near the borders between Myanmar and northern Thailand. Reduced visibility and elevated air quality readings were reported in some stations over northern Thailand on several days. In Mae Hong Son, the PM10 reading exceeded 150 ug/m3 (Unhealthy range) on 27 February 2017. 2.3 Hotspot activities in the southern ASEAN region remained largely subdued due to the prevailing wet weather conditions. 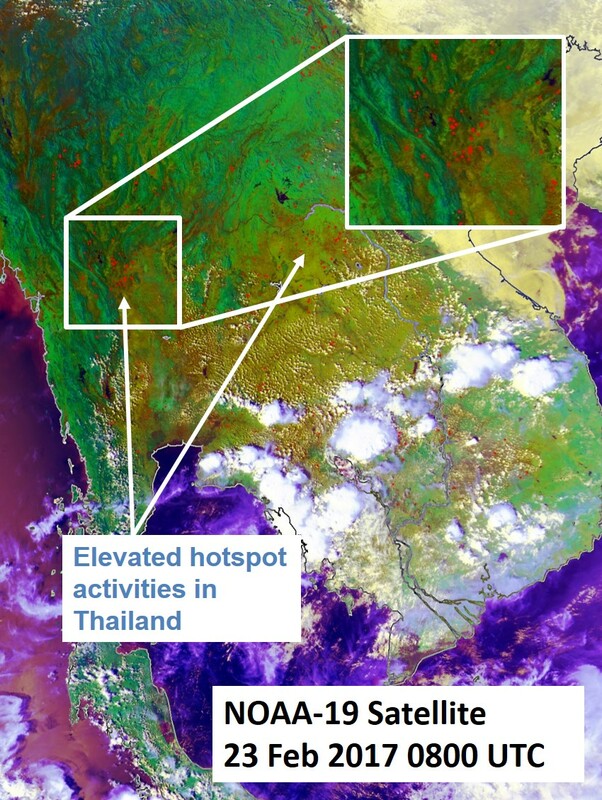 2.4 Satellite images depicting some of the hotspot activities over parts of the ASEAN region during February 2017 are shown in Figure 5 – Figure 9. Fig. 5: NOAA-19 satellite image on 5 March 2017 shows scattered hotspots with smoke haze observed in central Thailand and northern Cambodia. Fig. 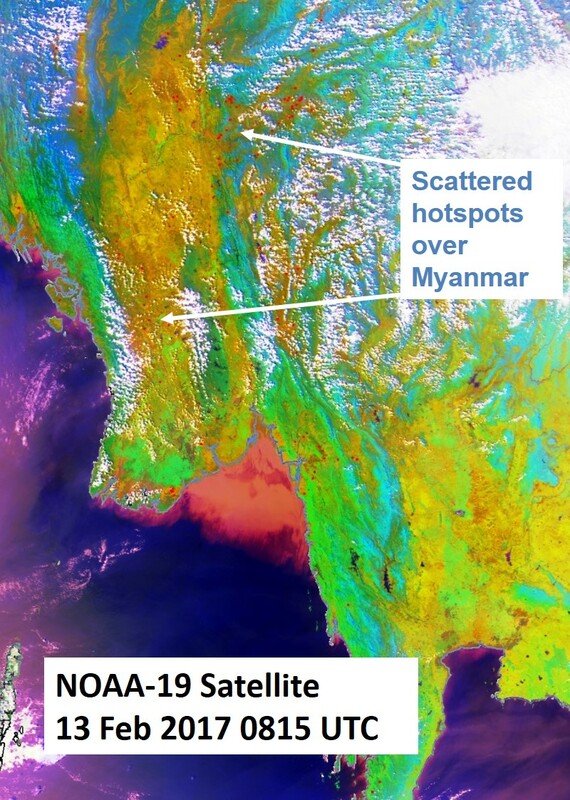 6:NOAA-19 satellite image on 13 March 2017 shows scattered hotspots detected in parts of Myanmar. 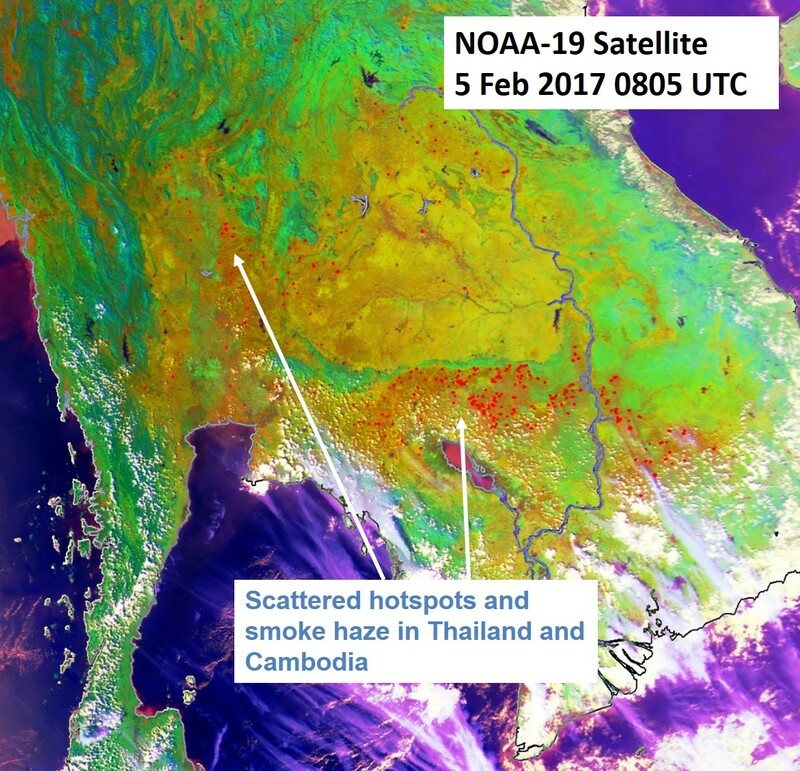 Figure 7: NOAA-19 satellite image on 23 March 2017 shows elevated hotspot activities detected in northern Thailand. Fire hotspots in Cambodia and Vietnam were subdued due to shower activities. 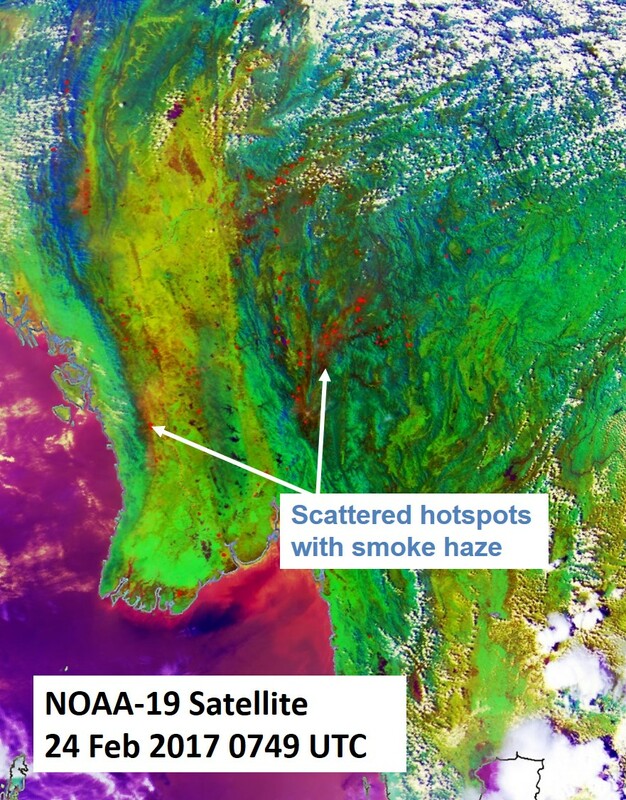 Figure 8: NOAA-19 satellite image on 24 March 2017 shows few clusters of hotspots with smoke haze detected in Myanmar. 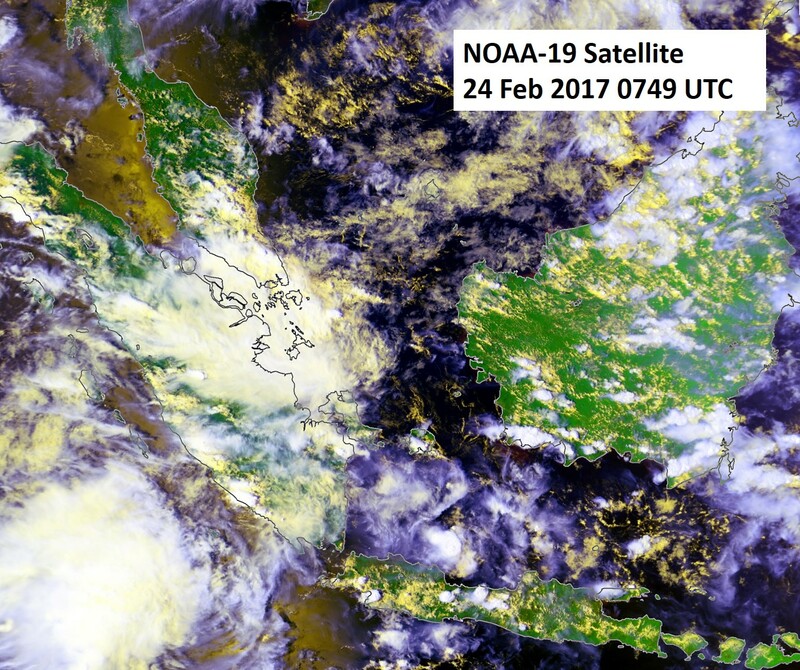 Figure 9: NOAA-19 satellite image on 24 March 2017 shows hotspot activities subdued over the southern ASEAN region due to wet weather conditions. 2.5 The hotspot distribution charts and daily hotspot charts for February 2017 are shown in Figure 10, Figure 11 and Figure 12 respectively. 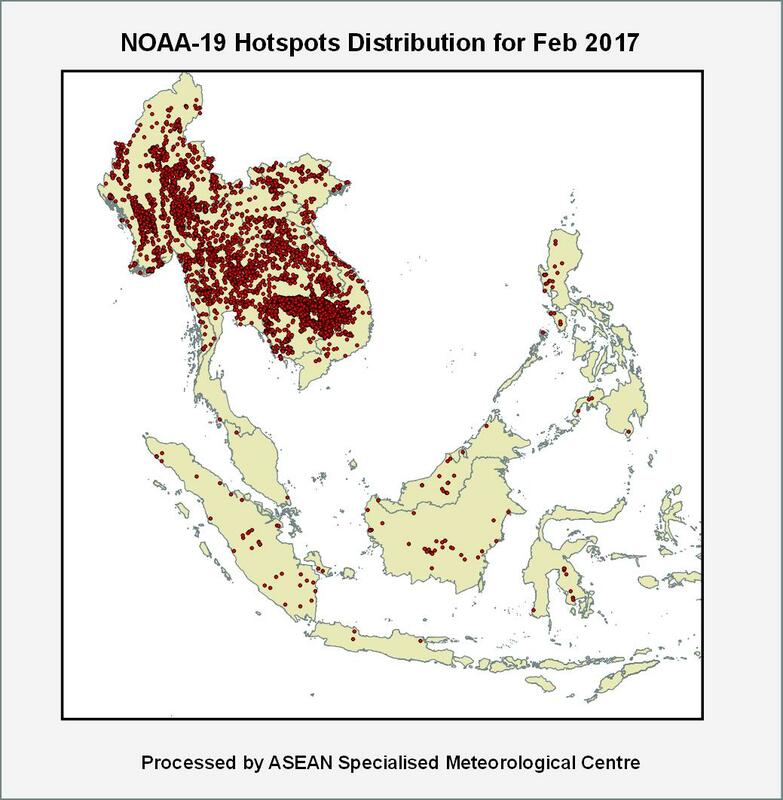 2.6 In February 2017, a high density of hotspots was observed in the northern ASEAN region, particularly over Myanmar, Thailand and Cambodia. A large number of hotspots persisted over the Myanmar-Thailand border between Naypyitaw, Myanmar and Mae Hong Son province Thailand. In Thailand, most of the hotspots were detected in the areas close to Kamphaeng Phet, Phetchabun and Sakon Nakhon provinces. In Cambodia, large clusters of hotspots persisted over the northern half of the country between Siem Reap and Mondulkiri. 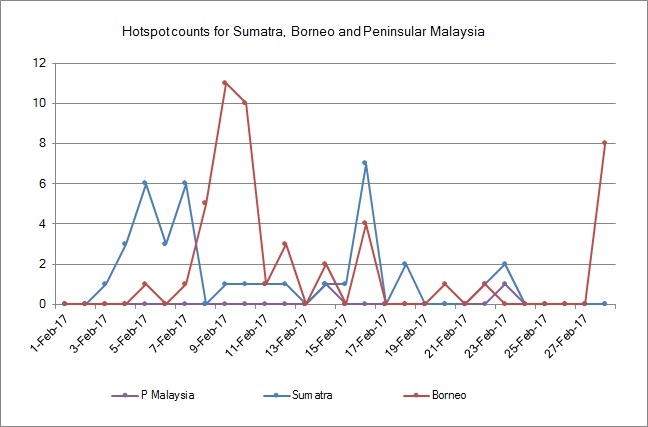 In the southern ASEAN region, the number of hotspots detected remained low. 3.1 Most climate models indicate the tropical Pacific will continue to remain at neutral levels but may warm gradually from March 2017 onwards. Given the observations and outlook, an extension of La Niña is the least likely scenario until mid-2017. 3.2 Few models suggest that the warming may reach El Niño levels again in 3Q 2017. However, as the seasonal prediction model outlooks of El Nino at this time of the year is known to have the least skill, a more confident assessment of El Niño risk will be available around mid-2017. 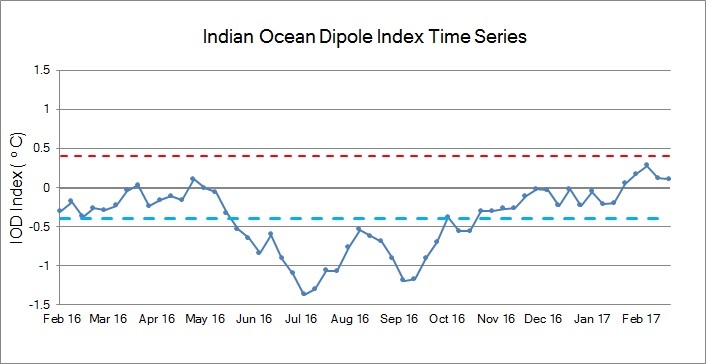 3.4 In February 2017, the Indian Ocean Dipole (IOD) index increased slightly but continued to remain at neutral levels, as shown in Figure 13. International climate models forecast the IOD to remain neutral and would unlikely have a significant influence on the weather over the region for the next few months. The formation of IOD typically starts around May or June, and peaks between August and October before decaying rapidly between December and April.